The past week’s “Essential 100” scripture reading carried me through the life of Joseph. The child of Jacob’s older age and the only child of his beloved wife Rachel, Joseph was treated with special preference. We see how this created jealously and anger in his older brothers and they sold him into slavery in Egypt, allowing their father to believe that he was dead. In Egypt Joseph became the slave of Potiphar, the captain of the guard, and he excelled so greatly in management that he was given complete reign of his mater’s home. When his master’s wife became incensed that Joseph would not sleep with her, she falsely accused him of taking advantage of her and so Potiphar had Joseph put in prison. Yet even there, God blessed everything that Joseph undertook and he became manager of the prisoners. God gave Joseph the interpretation of dreams so that after several years in prison, he was summoned by the Pharoah to interpret his dream. After Joseph gave the interpretation and gave God the credit, Pharoah made Joseph the head of Egypt, second only to himself. He was given position, wealth and a wife who bore him two sons. When famine came, and Joseph had prepared Egypt to deal with it, his brothers came to buy food and he was eventually reconciled to them, and his father, and took care of them all. HONOR: The Bible does not record any whining, complaining or blaming. Instead we see a life lived in pursuit of honoring God in any circumstances. Joseph lived through many long and exceedingly difficult seasons before ascending to power in Egypt, but he didn’t focus on his hardships. Instead, he “took the bull by the horns” as we would say. Whatever was entrusted to him he focused on doing well, giving God complete credit for his abilities and successes, with the goal of honoring God. Joseph never made it about him. He always shifted the focus back onto God. REDEMPTION: Romans 8:28 tells us that God works everything together for good for those who love God and are called according to His purposes. 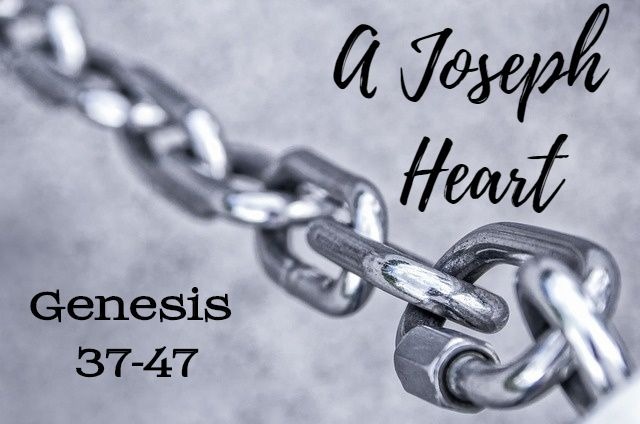 Joseph’s account is one of the ultimate Old Testament examples of how God may not cause our circumstances, but He uses them to orchestrate fulfillment of His plans. God redeemed Joseph’s brothers–Through Joseph’s compassion in forgiving his brother’s and pointing out how God used their wrong decision to harm Joseph in order to preserve the entire region through him, they were freed of their guilt and able to live in confidence of God’s promises to them. God redeemed Israel from the famine–God promised to send the Savior through Jacob’s line of Israel, but that would not come about if they all starved. God placed Joseph in the gap for Israel, like Christ stands in the gap for us, preserving them until God could fulfill His promise to give them their inheritance (when the judgement on the Ammorites was complete, as we learned earlier in Genesis). God redeemed Joseph. He kept him free from bitterness, blessed everything he set his mind to, and he brought him out of slavery and imprisonment to place him in a position of Honor. What could have ruined Joseph, God used to make him strong. Joseph offered even his brokenness to God, and God used it for glory. God reconciled Joseph to his family. He was able to see his father again. He forgave his brothers and became their caretaker. God’s plan was preserved and continued to move forward so that Jesus could be born of the descendants of Israel. And we know it was through Him that all men are reconciled to God. If only I can remember not to gripe. Instead let me seek honor, and strive to do my best even when the job is lowly and I’m moving slowly!! God give me the grace to remember that He is working in every circumstance. That my brokenness isn’t beyond being used by Him. That even when I find myself in desperate situations, God never wastes pain. Let me never forget that it’s not about me… it’s all about God’s plans, and God is all about redemption and reconciliation. So let forgiveness be my default. Let concern for others overtake any selfish tendencies. Let me be content with honoring God, and let God do whatever He wants with the rest. Are Magnetic Toys Safe for Our Children’s Health?